US and NATO casualties in Afghanistan jumped sharply this week as some 4,000 US Marines and 650 Afghan army troops poured into Helmand province, Afghanistan's largest producer, which supplies more than half of the world's opium by itself. According to the war monitoring site icasualties.org least 23 US and NATO soldiers were killed in fighting this week, although not all the casualties came from Helmand. The pace of casualties this month, with 26 already, is set to easily surpass last year's June toll of 30. Every month this year, the US and NATO death toll has eclipsed last year's figures. The only exception was April, which saw 14 NATO and US deaths in both years. NATO and US military commanders have warned that this year's offensives against a Taliban insurgency flush with opium and heroin funds would be bloody, and they've been right. So far this year, 179 coalition troops have been killed, a pace that will easily eclipse last year's record 254 coalition deaths. In fact, each year since 2003 has seen a new record number of US and NATO troops killed. Some 1,224 coalition troops have been killed in Afghanistan since the US invaded in late 2001. The US leads the casualty count with 728 killed, followed by Great Britain with 176, and Canada with 124. 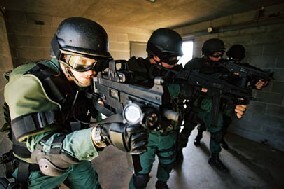 Several other NATO countries, including France, Germany, and Spain, have had dozens of troops killed. Key to winning popular support in Helmand is the new US strategy of ignoring poppy cultivation. Instead of alienating farmers by destroying their crops, the West will concentrate on traffickers and traders linked to the Taliban. It is a smarter strategy than eradication, but whether it is a smart strategy -- whether it will work -- remains to be seen. Gretchen Peters certainly has a sense of timing. She spent the last decade covering Afghanistan and Pakistan, first for the Associated Press and later for ABC News, and managed to bring "Seeds of Terror" to press just as the US and its NATO allies in Afghanistan begin lurching toward a new approach to drug policy there. Just this past weekend, the US announced it was giving up on trying to eradicate its way to victory over the poppy crop, and for the past few weeks, news accounts of US and NATO attacks on traffickers, opium stockpiles, and heroin labs have been coming at a steady, if not escalating, pace. Peters' thesis -- that the immensely lucrative opium and heroin trade is funding the Taliban and Al Qaeda to the tune of hundreds of millions of dollars a year, which they use to wage their insurgency against the West and allies in Afghanistan -- while portrayed as stunning and shocking, is nothing new to readers of the Chronicle, or anyone else who has been following events in Afghanistan since before the 2001 US invasion. But where "Seeds of Terror" shines is in its unparalleled detail and depth of knowledge of the drug trade, the Taliban/Al Qaeda insurgency, the Pakistan connection, and the intricate and complicated linkages between the actors. With access to government and security officials from the US, as well as Pakistan and Afghanistan, and through interviews with everyone from simple famers to fighters to opium traders and even some amazingly high-up people in the international heroin trade, Peters is able to navigate and share with readers the murky, ever shifting nature of the beast. She is especially useful in unraveling the various groupings that are simplistically referred to as "the Taliban." There is no single Taliban, Peters explains; there are rival warlords (Hekmatyar, Haqqani, Mullah Omar) running their drug empires and fighting to drive out the Westerners, their jihadist convictions clouded more each year in a haze of opium smoke and illicit profits. And then there are what are in essence criminal drug trafficking organizations. They, too, will identify themselves as Taliban for pragmatic reasons -- the intimidation factor, mainly -- but have little interest in holy war, except as it provides the chaotic cover for their underground trade. Actually, as Peters details, the story goes back a generation further, to the last great American intervention into this Fourth World country on the other side of the planet. Then, during the Reagan-era sponsorship of the Afghan mujahedeen fighting to drive out the Soviet Red Army, millions of Afghans fled into refugee camps in Pakistan, and would-be warlords and foreign jihadis (including a young Osama bin Laden), tussled for the billions of dollars coming from Washington and doled out by Pakistani intelligence, or, alternately, from funding sources in Saudi Arabia. Those warlords turned Pakistan, particularly the refugee-ridden Northwest Frontier territories into a leading opium producer during the 1980s, to ensure sources of funding for their armies, and secondarily, to turn as many Russian soldiers into junkies as they could. The Pakistani drug trafficking networks, including some very highly placed army and other officials, set up then are still the main conduits for the opium and heroin leaving Afghanistan today. Man, talk about your blowback. Peters has a keen grasp of local affairs, knows how to write, and has constructed a gripping and informative narrative. But, faced with a counterinsurgency effort that has floundered, in good part because of profits from the illicit drug trade keeping the Taliban well-supplied with shiny new weapons, she cannot resist the temptation to try her own hand at recommending more effective policies. Here, unfortunately, she is decidedly conventional and unquestioning of the prohibitionist paradigm. For example, the proposal floated by The Senlis Council in 2005 to simply buy up the poppy crop and divert it into the legitimate medical market gets remarkably short shrift. Peters devotes a mere paragraph to the plan, dismissing it as not pragmatic -- a position not universally held by experts. Similarly, her policy prescriptions, while including such progressive developmentalist planks as alternative livelihood programs, strengthening institutions, and opening new markets for new crops, also include a call to "arrest or kill" drug kingpins, heroin lab chemists, and even mid-level traffickers. She also advocates air strikes against smuggling convoys, "smarter" counterinsurgency, and beefed up law enforcement against the "bad guys." Peters' thinking on drug policy may be decidedly inside the box, but her contribution to our understanding of the complex nexus between the illicit drug trade in Afghanistan, local insurgencies, and global jihadi ambitions is important and chilling. This is the best layperson's guide to that nexus out there. 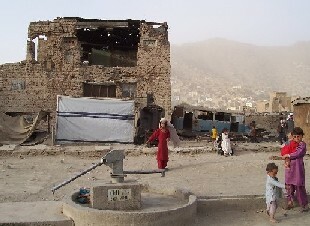 As summer arrives in Afghanistan, it's not just the temperature that is heating up. Nearly 20,000 additional US troops are joining American and NATO forces on the ground, bringing foreign troop totals to nearly 90,000, and an insurgency grown wealthy off the opium and heroin trade is engaging them with dozens of attacks a day across the country. But this year, something different is going on: For the first time, the West is taking direct aim at the drug trafficking networks that deliver hundreds of millions of dollars a year to the insurgents. Last week, hundreds of British and Afghan troops backed by US and Canadian helicopters and US jets engaged in a series of raids in southern Helmand province, the country's largest opium producing and heroin refining region, seizing 5,500 kilograms of opium paste, 220 kilos of morphine, more than 100 kilos of heroin, and 148 kilos of hashish. They also uncovered and destroyed heroin labs and weapons caches, fending off Taliban machine gun and rocket-propelled grenade attacks as they did so. "This has been an important operation against the illegal narcotics industry and represents a significant setback for the insurgency in Helmand Province," said Lt. Col. Stephen Cartwright, commanding officer of some of the British troops. "The link between the insurgents and the narcotics industry is proven as militants use the money derived from the drug trade as a principle source of funding to arm themselves with weapons and conduct their campaign of intimidation and violence. By destroying this opium and the drug making facilities we are directly target their fighting capability. The operation has been well received by the Afghan people." It wasn't the first Western attack on the Afghan drug trade this year, and it certainly won't be the last. Operating since last fall on new marching orders, Western troops and their Afghan allies are for the first time engaging in serious drug war as part of their seemingly endless counterinsurgency. And they are drawing a sharp response from the Taliban, which must be seen not so much as a monolithic Islamic fundamentalist movement, but as an ever-shifting amalgam of jihadis, home-grown and foreign, competing warlords, including the titular head of the movement, Mullah Omar, disenchanted tribesmen, and purely criminal drug trafficking organizations collectively called "the Taliban." So far this year, 142 NATO and US troops have been killed in the fighting, putting 2009 on a pace to be the bloodiest year yet for the West in the now nearly eight-year-old invasion, occupation, and counterinsurgency aimed at uprooting the Taliban and its Al Qaeda allies. Also dead are hundreds, if not more, Taliban fighters, and an unknown number of Afghan civilians, victims of Western air strikes, twitchy trigger fingers, and unending Taliban attacks on security forces and public places. There will be "tough fighting" this summer and beyond in Afghanistan, top US commander Gen. David Petraeus said Wednesday in remarks to reporters in Tampa. As US and NATO troops go on the offensive "to take back from the Taliban areas that they have been able to control, there will be tough fighting," he said. "Certainly that tough fighting will not be concluded just this year. Certainly there will be tough periods beyond this year," he added, noting that the Taliban insurgency is at its bloodiest levels since 2001. That rising insurgency, financed in large part by drug trade profits, has sparked a rethinking of Western anti-drug strategy, as well as the deployment of nearly 20,000 additional troops, with some 7,000 of them headed for Helmand, which, if it were a country, would be the world's largest opium producer. Admiral Michael Mullen, chairman of the US Joint Chiefs of Staff, laid out the new thinking in testimony to the Senate last month. The West is losing the battle against opium production, he said, so instead of merely going after Taliban militants it is time to "go after" the powerful drug lords who control the trafficking and smuggling networks in Afghanistan. "With respect to the narcotics -- the threat that is there -- it is very clearly funding the insurgency. We know that, and strategically, my view is that it has to be eliminated," Mullen said. "We have had almost no success in the last seven or eight years doing that, including this year's efforts, because we are unable to put viable livelihood in behind any kind of eradication." While the new approach -- de-emphasized eradication of farmers' fields and targeting the drug trade, especially when linked to the insurgency -- is better than the approach of the Bush years, it is still rife with problems, obstacles, and uncertainties, said a trio of experts consulted by the Chronicle. "We are seeing a clear shift away from eradication being the dominant focus and a clear emphasis on rural development as a way to proceed, and that is a major positive development," said Vanda Felbab-Brown, a scholar of drugs and insurgency at the Brookings Institution. "Interdiction was always nominally part of the package, but there is now a new mandate. Since October, NATO countries can participate in the interdiction of Taliban-linked traffickers. Certainly, the US and the UK are planning to vastly engage in this mission." "The whole policy has changed," agreed Raheem Yaseer, assistant director of the Afghanistan Studies Center at the University of Nebraska-Omaha. "There was lots of criticism about the troops not going after the drug leaders and the trafficking. They were concentrating on the terrorists, but now they realize the opium traffic has actually been used to finance their activities, so now they are trying to eliminate the traffickers and promoters of the trade," he explained. "There is more emphasis on reconstruction," said Yaseer. "There will be some compensation for people who are giving up the poppy, and shifting from poppy to saffron, things like that. Still, security is key, and there are some problems with security," he added in a masterful use of understatement. "The administration appears at least to understand that eradication should target cartels rather than poor local farmers," said Malou Innocent, a foreign policy analyst with the libertarian leaning Cato Institute. "I hope they continue down that path; it's the best of many horrible options. The best policy would be legalization," she said, adding wistfully that she would prefer a more sensible drug policy. "I have a feeling this is going to be a very bloody summer," said Malou. "There will be more violence because of the Afghan elections this August, as well as the Taliban's annual spring and summer offensive, which this year is going to be a sort of counteroffensive to the Western surge." What the new emphasis on going after traffickers will accomplish remains to be seen, said Felbab-Brown. "Interdiction could provide a good reason for the Taliban to insert itself more deeply into the drug trade, or it could encourage traffickers to join the Karzai government," she said. The effect of the new campaign on security in the countryside also remains to be seen, Felbab-Brown said. "Our reconstruction capacity is so weak after decades of neglect and a systematic effort to destroy those projects," she noted. "At bottom, though, the effectiveness of rural development programs depends on security. Without security, there is no effective program." Western military forces also have some image-building to do, said Yaseer. "Because of wrong policies of the past and high civilian casualties, the original favorable perception of the foreign troops has changed from favorable to antagonistic. It will take some time to get back the good image." Yaseer also had doubts about the utility of the massive foreign, mainly US, troop increase now underway. "Unless the sources of the problem, which lie in Pakistan, are attacked, adding more troops will not be very useful," he said. "They will just make the region more volatile and create more resentment, and they will provide the insurgents with a larger target than before," he said. "The new administration's desire to change the policy makes one a bit optimistic, but again, time will tell whether the West is serious about them," Yaseer continued. Progress will depend on the nature of the operations and whether the new policies are actually implemented, whether this is real." For Malou, the clock is ticking, and Western soldiers have no good reason to be remaining in Afghanistan for much longer. "We haven't found bin Laden in eight years, and most of the high-level Al Qaeda we've captured have been the result of police detective work, not military force. The foreign military presence in Afghanistan is perceived as a foreign occupation by many people in the region on both sides of the border, and that's poisoning the well even further," she said. The US needs to be planning an exit strategy, said Malou. "When you look strategically and economically, the US just doesn't have a vital interest impelling us to stay in the region indefinitely," she said. "We need a timeframe for withdrawal within the next several years. We need to narrow our objectives to training security forces. I don't see any reason why we need to stay in this region any longer." Leftist guerrillas of the Shining Path killed 14 Peruvian soldiers in a pair of ambushes in Ayacucho province, in the remote and rugged coca-growing region of the VRAE (Apurímac and Ene River valleys) last week, and they are vowing to do it again. Last week's attack on the military was the deadliest since last October, when 13 soldiers and two civilians were killed in an ambush of a military convoy in neighboring Huancavelica province. The Shining Path originated in Ayacucho province as a revolutionary Maoist movement with roots going back to the 1960s. In the 1980s, in an all-out bid for power, the Shining Path battled government forces in a ruthless insurgency and counterinsurgency that left 70,000 Peruvians dead before the group's founder and leader, Abimael Guzmán, was captured in 1992. At its height, the Shining Path fielded 10,000 men, with countless thousands of supporters providing infrastructure, but today its numbers of armed combatants are estimated to be between 300 and 500. It is widely held that the group has largely shed its ideology and settled in to a life as a criminal drug trafficking organization. But it can still talk the talk. "We will fight militarily those who defend imperialism and the government, and they are the armed forces and the police," Victor Quispe Palomino, who identified himself by his rebel name, Comrade José, said in a call to a radio station, Reuters reported. The ambushes and threats are the group's strongest response yet to a Peruvian government effort to retake control of the VRAE, where some 40,000 families earn a living from coca fields. Since that effort got underway last August, at least 33 soldiers have been killed. The move in the VRAE is part and parcel of President Alan García's broader effort to suppress coca production through eradication programs backed by the US. The world's second largest coca producer, Peru receives funds from the US for its eradication programs. García's plan also includes building schools and hospitals in remote towns, but it seems the army has a greater presence than the government's development teams. But the Shining Path is also showing signs of deep pockets. Like the Taliban in Afghanistan, it is profiting from prohibition, and the results can be deadly, said critics of García's program. "The Shining Path is using more and more fire power in each attack," Fernando Rospigliosi, a former interior minister, told RPP Radio in Lima. "The plan has not produced results and the government keeps on insisting on the wrong strategy." The situation was "unacceptable," said ex-Army chief Edwin Donayre. "There are principles applicable to conventional warfare that do not suffice for non-conventional war," he told RPP. "We have zero results so we need to reconfigure our strategy." But President García is talking tough. "The terrorists won't hold us back," García said. "Our armed forces are trained to smash them." Mexico and its wave of prohibition-related violence were front and center in Washington this week as the Obama administration unveiled its "comprehensive response and commitment" to US-Mexico border security and Secretary of State Hillary Clinton traveled to Mexico to preach renewed support in the fight against the powerful drug trafficking organizations, but also to enunciate a mea culpa for the US role in the bloody situation. More than 9,000 people -- including more than 600 police and soldiers -- have been killed in prohibition-related violence in Mexico since President Felipe Calderon sent out the Mexican armed forces to subdue the cartels at the beginning of 2007, with the pace of killing accelerating last year and early this year. Now, some 45,000 Mexican army troops are part of the campaign, including more than 8,000 that are currently occupying Ciudad Juarez, across from El Paso, which has seen some of the highest levels of violence anywhere in the country. More than 1,600 were killed there last year, and more than a hundred so far this year. Calderon intervened in ongoing rivalries between various trafficking organizations, helping to turn what had been turf wars for valuable drug smuggling franchises into a multi-sided battle pitching the cartels against each other and Mexican police and soldiers. The prize is a cross-border smuggling fortune estimated at anywhere between $10 billion and $40 billion and based on Americans' insatiable appetite for the drugs it loves to hate (or hates to love). "The whole package we announced today is not only about enforcement and stopping the flow of drugs into the United States and helping Mexico against these very brutal cartels, but it includes money for more drug courts and reduction in demand," Homeland Security Secretary Janet Napolitano said in an interview Tuesday. "So, we look forward to working on the demand side as well as the supply side, but I'll tell you, where the Department of Homeland Security is concerned, it's all about border safety and security and making sure that spillover violence does not erupt in our own country." "Clearly what we've been doing has not worked," Clinton told reporters on her plane at the start of her two-day trip. "Our insatiable demand for illegal drugs fuels the drug trade," she added. "Our inability to prevent weapons from being illegally smuggled across the border to arm these criminals causes the deaths of police, of soldiers and civilians." Clinton's visit came as the chorus calling for change in US prohibitionist drug policies is growing louder. Last month, former presidents of Brazil, Colombia, and Mexico called on the US to radically reassess its drug policies, and increasing concern over the violence in Mexico and its spillover in US border states is only turning up the volume of the calls for legalization. Law enforcement on the border wants much more help -- Texas Gov. Rick Perry (R) has called for 1,000 more agents or even National Guard troops -- but Zapata County (Texas) Sheriff Sigifredo Gonzalez, Jr., head of the Southwestern Border Sheriff's Association, said the administration move was a start. "The plan the president announced is a help," said Gonzalez. "But we still haven't seen the plan that was supposed to be in place last year." Gonzalez's remote Zapata County has not seen much spillover from the violence across the river, but that's not the case elsewhere, the sheriff said. "As chairman of the association, I hear regularly from my colleagues that what we are seeing is spillover that has been going on for some time -- extortions, kidnapping, robberies. What we're concerned with now is that with the squeeze on in Mexico, there will be even more spillover here." While security officials and law enforcement were talking more drug war, other observers doubted that the initiative would have much impact on the cartels and could make an intractable problem even worse. But they also saw an opportunity to advance the cause of ending America's reliance on drug prohibition as the primary approach to drug use. "This is not a major departure from what was budgeted under the Bush administration," said Ethan Nadelmann, executive director of the Drug Policy Alliance. "The most important assistance the US can provide is intelligence-related assets, as in Colombia in the 1980s and 1990s -- CIA or NSA-type information that helps the Mexicans target the most violent and powerful of the traffickers. Providing financial assistance to help pay local police more is also helpful, but beefing up the border is largely symbolic and is responding to both legitimate concerns as well as media and political hysteria around this. This is not a departure, not a major new initiative." "The biggest problem in all this is that Calderon's policies have thrown gasoline on the fire," said Sanho Tree, drug policy analyst for the Institute for Policy Studies in Washington, DC. "It was utterly foolish of Calderon to get in the middle of a cartel turf war. Those people are all about making money, and the violence isn't going to decline until the cartels reach a modus vivendi among themselves. There are rumors they are trying to do that; they want the killing to stop so they can get back to business." Neither should we take much comfort in Mexico's ability to occasionally kill or capture a leading cartel figure, said Tree. "It's like killing Al Qaeda's number three man," he laughed grimly. "All it means is someone below him is going to move up, or there will be a struggle to see who replaces him." For Tree, the situation in Mexico is taking on the ominous aspect of Colombia in the 1990s, where the breakdown of public security led to vigilantism and death squad activity, the predecessors of the Colombian paramilitaries. "When people became to realize the state was powerless to stop prohibition-related violence, it opened the door for other criminal activities, including kidnapping, and what makes this really dangerous is that now the ability of the state to protect individuals comes into question." But Tree also noted that the situation in Mexico is forcing American media and policymakers to at least address calls for drug legalization. "This is doing what Colombia and Afghanistan couldn't do, which is to bring the violence of prohibition right to our door step and rub our faces in it," said Tree. "Calderon got in between some hornets' nests with a fly swatter, and now people in both countries have to make a choice. Mexicans supported this at first, but when they realized this isn't ending but is instead getting worse, they asked why he picked this fight." "I'm worried about the militarization of the border and the assumption that that will fix this," said Larry Birns, director of the Council on Hemispheric Affairs in Washington, DC. "On the other hand, it seems to be causing a growing crescendo of people wanting to talk about drug legalization. It's as if a critical mass has been arrived at. The recent statement by the three Latin American presidents was a voltaic shock to get the discussion going, and with the violence in Mexico, one has to acknowledge that a preponderance of the evidence shows the present model for drug control is not working. Even though there is a huge, formidable self-interested drug prohibition lobby, the logic of legalization is becoming so compelling it becomes all but impossible not to address it." That political space to discuss legalization is changing things, Birns said. "Organizations like my own, which were timorous about taking on this issue now feel much more at ease with the clear recognition that everything else has failed. The possibility of legalization has to be seriously reviewed, inspected, and debated now." Nadelmann suggested the current crisis could and should open debate about effective demand reduction strategies. "If we want to help Mexico by reducing demand, and want to give the notion more than lip service, then we have to remove the ideological inhibitions that limit our ability to effectively reduce demand," he said. "A small number of drug users consume a significant portion of all drugs. The traditional answer is to get more serious about drug treatment and rehab, but it could also mean providing addicts with legal sources of the drugs they are consuming. We know it works with heroin; the same approach deserves to be tried with cocaine and meth." "The other thing we can do," Nadelmann argued, "is to move in the direction of legalizing marijuana. We know have 40% of Americans in favor of it, and it's approaching 50% out West. This is the first time a furor over drug-related violence has been so powerfully linked with marijuana prohibition. That mere fact that so many law enforcement people are saying it lends it credibility. This is putting the notion of marijuana legalization as a partial solution to prohibition-related violence on the edge of the mainstream political discussion in the US. With the Ammiano bill in California, Barney Frank's bill waiting to be introduced, Sen. Webb pushing for his commission, the conversation is really bubbling up now." And so it goes. As the prohibition-related violence in Mexico continues and as the US appears to be heading down the reflexive path of fighting drug war failure with more drug war, the prohibitionist consensus grows ever more brittle. It's a shame that so many Mexicans have to die to get us to shift the direction of our dialogue on drugs. A coca trade fair in Lima designed to demonstrate that coca is not cocaine showcased a number of products, but the star of the show was a coca leaf beer whose manufacturer has plans to export it to markets in Latin America, Africa, and Asia. The fair was organized by the National Confederation of Agricultural Producers of the Coca Valleys of Peru (CONPACCP), the country's largest coca growers' union. 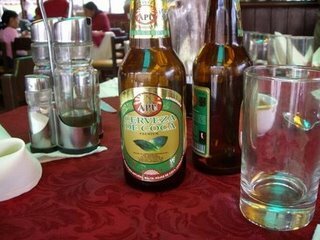 The coca beer, sold under the brand name Apu by the entrepreneurial Alarcón family of Andahuaylas, is already being sold (and eagerly consumed) in Peru's Andean region, as well as markets in Lima. General manager Manuel Alarcón told Living in Peru the beer was a big hit with tourists at Machu Picchu. But with a production capacity of 180,000 bottles a month, Alarcón is looking outside the domestic market. Alarcon said the paperwork is already underway to export Apu to China, South Africa, Argentina, and Venezuela. That seems like a breach of the 1961 UN Single Convention on Narcotics, which sought to phase out use of the coca plant, excepting de-cocainized products such as Coca Cola. Some contest that interpretation of international law, however, and given that Venezuela has already inked deals with Bolivia to import coca products, it seems the treaty is sometimes observed only in the breach. "Thankfully China is a country where coca leaves are accepted and its derivatives can easily enter the country," said Alarcón. 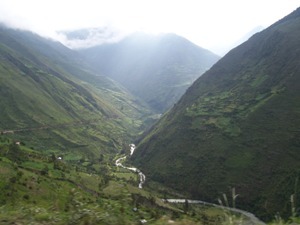 Peru is the world's second largest coca producer, after Colombia and ahead of Bolivia. While some of the country's hundreds of thousands of small producers are registered with the national coca monopoly and deliver their harvests to it, the majority of producers are not legally growing the plant, and much of it is destined for the insatiable international cocaine market. 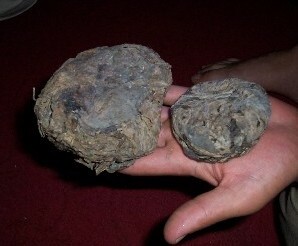 The situation has led to years of conflict between coca growers and the Peruvian national government. If recent reports are to be believed, it is now leading to a resurgence of the Shining Path and an increasingly violent counterinsurgency operation by the Peruvian military in the Apurímac and Ene River valleys. The political statement is supposed to evaluate the implementation of the previous political declaration and action plan approved by the UN General Assembly Special Session (UNGASS) in 1998. At the 1998 session, UNGASS adopted the slogan "A Drug-Free World -- We Can Do It" and launched a "campaign" to wipe out all drug crops -- from marijuana to opium to coca -- by 2008. But while the international community continues to slide down its century-old prohibitionist path regarding non-medicinal drug use and sales, it is encountering an increasing amount of friction. The United States, as leader of the hard-liners, continues to dominate the debates and set the agenda, but an emerging bloc of mainly Latin American and European countries is expressing deep reservations about continuing the same policies for another decade. The atmosphere in Vienna this week was circus like, complete with street protests, as national delegations, non-governmental organizations (NGOs), and other interested parties heatedly debated what an increasingly vociferous minority called a "failed" approach to the issue. Debate was particularly intense about the inclusion of harm reduction in the political statement -- a position rejected by the US delegation, led by outgoing acting drug czar Edward Jurith. The drug summit came as the UN, the CND, and the countries pushing the prohibitionist hard-line have come under repeated attack for essentially maintaining the status quo. On Tuesday, the European Commission issued a report that found while in the past decade policies to help drug users and go after drug traffickers have matured, there was little evidence to suggest that the global drug situation had improved. "Broadly speaking the situation has improved a little in some of the richer countries, while for others it worsened, and for some of those it worsened sharply and substantially, among which are a few large developing or transitional countries," an EC media statement on the report said. "In other words, the world drugs problem seems to be more or less in the same state as in 1998: if anything, the situation has become more complex: prices for drugs in most Western countries have fallen since 1998 by as much as 10% to 30%, despite tougher sentencing of the sellers of e.g. cocaine and heroin in some of these markets." 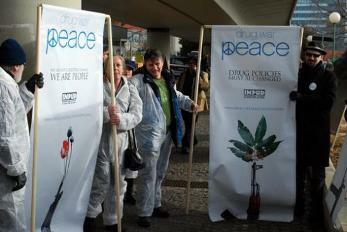 Current anti-drug policies also came under attack from a growing coalition of NGOs, including Human Rights Watch, the International Harm Reduction Association, the European NGO Coalition for Just and Effective Drug Policies (ENCOD), and the International Drug Policy Consortium, as well as various NGOs from the US, Brazil, Canada, and England, among others, all of whom were in Vienna for the meeting. Human Rights Watch urged the CND to undo a decade of neglect, while the English group Transform Drug Policy Foundation called for a moratorium on global strategic drug policy setting, a review of the consequences of prohibitionist policies, and a commission to explore alternatives to the failed war on drugs. "Every state that signs up to the political declaration at this commission recommits the UN to complicity in fighting a catastrophic war on drugs," said Danny Kushlick, policy director for Transform. "It is a tragic irony that the UN, so often renowned for peacekeeping, is being used to fight a war that brings untold misery to some of the most marginalized people on earth. 8,000 deaths in Mexico in recent years, the destabilization of Colombia and Afghanistan, continued corruption and instability in the Caribbean and West Africa are testament to the catastrophic impact of a drug control system based upon global prohibition. It is no surprise that the declaration is unlikely even to mention harm reduction, as it runs counter to the primary impact of the prevailing drug control system which, as the past ten years demonstrate, increases harm." Not all the action took place in the conference hall. Wednesday saw a lively demonstration by NGO groups including Students for Sensible Drug Policy, the drug user group INPUD, ENCOD, and the Hungarian Civil Liberties Union, among others. Protestors spoke to reporters from jail-like cages, waved signs and passed out pamphlets to delegates forced to run their gauntlet, and decried the harms of drug prohibition. One particularly effective protestor was dressed as a sun-glass wearing, cigar-puffing Mafioso, celebrating that business was good thanks to prohibition. Even UN Office on Drugs and Crime (UNODC) head Antonio Maria Costa, while whistling past the graveyard to insist that progress had been made in the past decade, acknowledged that current global policies have backfired in some ways. Giving the opening address Wednesday, Costa said "the world drug problem has been contained, but not solved" thanks to international anti-drug efforts. But global drug control efforts have had "a dramatic unintended consequence," he added, "a criminal black market of staggering proportions." The international drug trade is "undermining security and development and causing some to make a dangerous wager in favor of legalization. Drugs are not harmful because they are controlled; they are controlled because they are harmful." Drug legalization would be "a historic mistake," he said. Even so, Costa painted a dire picture of what prohibition had wrought: "When mafias can buy elections, candidates, political parties, in a word, power, the consequences can only be highly destabilizing" he said. "While ghettoes burn, West Africa is under attack, drug cartels threaten Central America and drug money penetrates bankrupt financial institutions". Not everybody was buying into the UNODC-CND-US position of more of the same. Bolivian President Evo Morales brandished a coca leaf, then chewed it during his address to the delegates to underline his demand that coca be removed from the list of proscribed substances. 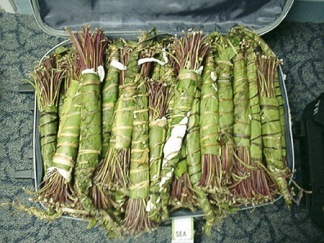 "This is coca leaf, this is not cocaine; this is part and parcel of a culture," Morales said. The ban on coca was a "major historical mistake," he added. "It has no harmful impact, no harmful impact at all in its natural state. It causes no mental disturbances, it does not make people run mad, as some would have us believe, and it does not cause addiction." Neighboring Brazil was also critical. "We ought to recognize the important progress achieved over the last decade," said Brazilian delegate Jorge Armando Felix. "But the achievements have not been accomplished. The aim of a world free of drugs has proven to be unobtainable and in fact has led to unintended consequences such as the increase of the prison population, increase in violence related to an illegal drug market, increase in homicide and violence among the young population with a dramatic impact on mortality and life expectancy -- social exclusion due to drug use and the emergence of synthetic drugs." Felix also had some prescriptions for UNGASS and the CND. "At this historic moment with the opportunity to reassess the past 10 years and more importantly to think about the challenges to come, Brazil enforces the need for recognition of and moving towards: harm reduction strategies; assessing drug dependence, and HIV AIDS populations; securing the human rights of drug users; correcting the imbalance between investments in supply and demand reduction areas; increasing actions and programs of prevention based on scientific evidence with an emphasis towards vulnerable populations and towards increase of access to and care for problematic or vulnerable drug users; and to the acknowledgment of different models of treatment for the need for increased funding of these efforts." Brazilian Luiz Paulo Guanabara, head of the NGO Psicotropicus, observed it all with mixed feelings. "Early on, I thought the NGO strategy for harm reduction would not result in anything and that we should aim for drug regulation instead," he said. "And in the end, the term harm reduction is not in the political declaration, but the Beyond 2008 document is very strong and has not gone unnoticed." Guanabara had harsh words for both the Americans and the UN. "It seems like the American delegates believe harm reduction is a sin -- or they favor harm increase, so they can lock up more people and have more HIV patients, increase crime, sell more weapons and make money out of the disgrace of others and families' destruction. Their prohibitionist stance is obscene," he declared. "And these guys at the CND understand nothing of drugs and drug use, they are just bureaucrats. To put drugs in the hands of bureaucrats is as dangerous as putting them in the hands of criminals." But despite the lack of results this time around, Guanabara was thrilled by the participation of civil society. "The civil society mobilization is enormous and intense," he said. "The NGO events around the meeting were the real high-level meetings, not the low-level ones with the bureaucrats at the CND." 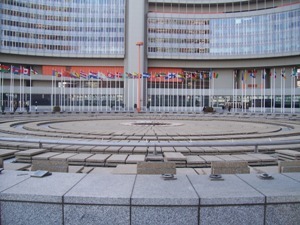 While the sentiments from Brazil and Bolivia were echoed by various national delegations, mainly European, and while even the UNODC and the US are willing to give nods to an increased emphasis on treatment and prevention, with the US delegation even going so far as to approve of needle exchanges, at the end of the day, the CND political declaration and action plan represents a stubborn adherence to the prohibitionist status quo. "Government delegations could have used this process to take stock of what has failed in the last decade in drug-control efforts, and to craft a new international drug policy that reflects current realities and challenges," said Prof. Gerry Stimson, executive director of the International Harm Reduction Association. "Instead, they produced a declaration that is not only weak -- it actually undermines fundamental health and human rights obligations." 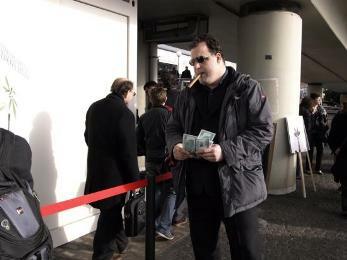 American attendee and long-time drug reform activist Michael Krawitz also had mixed feelings. "The slow train wreck that Harry Anslinger started with the 1961 Single Convention is finally grinding to a halt," he said. "The argument here has been a semantic one over harm reduction, but the subtext is much more important, and the subtext is that the treaties were set up to protect public health and are currently being interpreted in such a way as to do the opposite. The declaration wound up being watered down and piled high with reservations. The next five years should prove interesting." 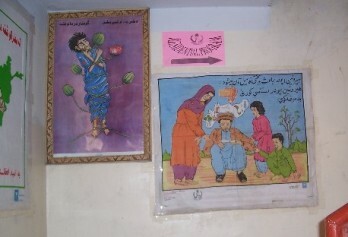 The IHRA and other NGOs called on governments with reservations about the political declaration to refuse to endorse it. That probably will not happen, but some governments have indicated they will add reservations to their approval of the declaration. After a century of prohibition, the first formal cracks are beginning to appear at the center of the legal backbone of global drug prohibition. Given that the dissent has largely appeared only since the last UNGASS in 1998, perhaps this isn't such a bad start. A blue-ribbon commission of Latin American leaders has issued a report saying that the US-led war on drugs has failed and it is time to consider new policies, particularly treating drug use as a public health problem and decriminalizing marijuana. The report is an attempt to intervene not only in Latin American, US, and European drug policy debates, but also in the United Nations' ongoing 10-year review of global drug policies, which will culminate next month in a ministerial meeting in Vienna. 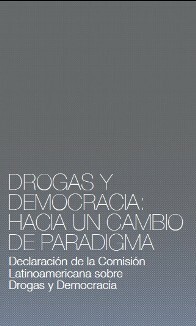 The report, Drugs and Democracy: Toward a Paradigm Shift, is the work of the Latin American Commission on Drugs and Democracy, a 17-member panel that includes former Brazilian President Fernando Henrique Cardoso, former Mexican President Ernesto Zedillo, and former Colombian President Cesar Gaviria. Other commission members include the writers Paulo Coelho, Mario Vargas Llosa, Sergio Ramírez and Tomás Eloy Martínez as well as leading scholars, media members and politicians. Latin America is the leading exporter of both cocaine and marijuana. As such, it has faced the ravages of heavy-handed American anti-drug interventions, such as Plan Colombia and earlier efforts to destroy the Bolivian coca crop, as well as the violence of drug trafficking organizations and politico-military formations of the left and right that have grown wealthy off the black market bonanza. And while the region's level of drug consumption has historically been low, it is on the rise. "The main reason we organized this commission is because the available evidence indicates the war on drugs is a failed war," said Cardoso at a Wednesday press conference in Rio de Janeiro to announce the report. "We need a different paradigm to cope with the problem of drugs. The power of organized crime is undermining the very foundations of democracy in some Latin American countries. We must acknowledge that these policies have failed and we must break the taboo that prevents us from discussing different strategies." Focus on enforcement against organized crime. The commission also called on governments and civil society around the globe to "assess in the light of public health and advanced medical science the possibility of decriminalizing possession of marijuana for personal consumption." "We need to break the taboo that's blocking an honest debate," Cardoso said, repeating one of the phrases of the day. "Numerous scientific studies show that the damage caused by marijuana is similar to that of alcohol or tobacco," said the well-respected former Brazilian leader. "Decriminalization is only part of the solution," warned former Colombian President Gaviria. "You need to do what the Europeans are doing, which is helping addicts. That's what the US doesn't do; it just puts them in jail," he scolded. "You tripled the jail population in the US in the last 20 years because of prohibitionism. The half million people in jail because of drug consumption, is that reducing consumption?" he asked. "The excuse is that people commit crimes to get money, but you deal with that putting addicts under a doctor and helping them with their problem." The commission has three objectives, said Gaviria. "We want to create a Latin American policy around the consumption of drugs, we want to promote a debate in the US -- we are very concerned that there is no real public debate on the politics of drug trafficking in US politics -- and we want the European Union countries to take more responsibility for drug consumption," he said. "They are not doing enough to reduce the consumption of drugs." "This report represents a major leap forward in the global drug policy debate," said Ethan Nadelmann, executive director of the Drug Policy Alliance, who addressed a commission session in Bogotá last September. "It's not the first high-level commission to call the drug war a failure, nor is it the first time any Latin American leader has criticized the prohibitionist approach to global drug control. But it is the first time that such a distinguished group of Latin Americans, including three highly regarded ex-presidents, have gone so far in their critique of US and global drug policy and recommendations for what needs to be done." The commission report is on "the cutting edge" of the global drug policy debate, said Nadelmann. "This is evident in its call for a 'paradigm shift,' in its recognition of the important role of harm reduction precepts and policies, in its push for decriminalization of cannabis, and in its critique of 'the criminalization of consumption.'" Now it is on to Vienna -- and beyond -- said commission members. It is past time for a new approach, not only in the US, but internationally, they said. "We hope the meeting in Vienna will not produce a result like previous meetings, where they just kept pushing back the date on which drugs will disappear," said Rubem Cesar Fernandes of the civil society organization Viva Rio. "The main discussion in Vienna should be whether the world should adopt European harm reduction policies. Most Latin American countries are supporting the approach of dealing with this as a health problem, not a criminal one." Fernandes looked with guarded optimism at the new Obama administration. "We hope the Obama administration will at least be able to open that possibility because now the US totally opposes harm reduction as good policy," he said. "The world is not moving to follow the US jail policy. The US needs to think about whether putting people in jail is really solving the problem." "Discussions in Vienna are not enough," said Cardoso. "We need national debates in all our countries, as well as inside the US. A clear dialog with the US is very important. We will try to get in contact with the Obama administration." And so the pressure builds, on both the UN and the US. Will it be enough to force dramatic changes in Vienna or Washington? Probably not yet. But the global prohibitionist consensus is crumbling, clearly if slowly.